If you have ever been to the Corrèze, then you will not easily forget this area. The same is true about this fantastic, completely renovated eight-person holiday home with private pool, dating back to 1769. Gorgeous in every way! All the original details were carefully preserved during the renovation. They now form a good mix with more modern and comfortable elements. You can enjoy the heated, enclosed swimming pool. 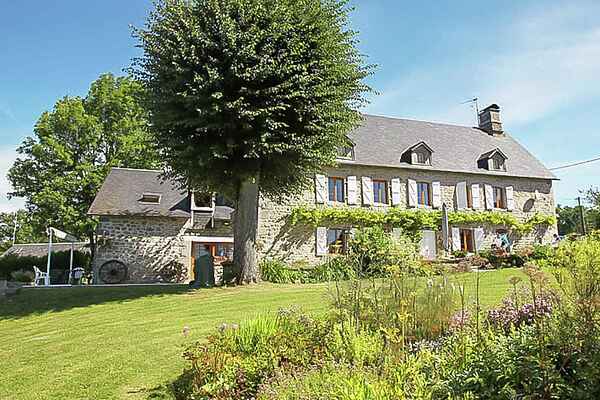 From the several nicely landscaped terraces and the large lawn - well equipped with garden furniture and parasols - you will not get easily bored with the fabulous view over the varied Corrèze. This area with green pastures has a lot to offer its visitors: its wild and unspoiled nature is waiting to be discovered by hikers, bikers and mountain bikers. There is also lots to discover in the Corrèze when it comes to culinary experiences. Limousin beef is world famous for its quality. You can prepare it on the BBQ or in the outdoor kitchen.